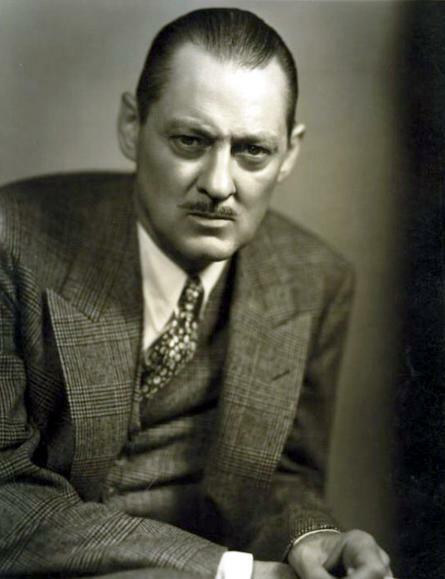 Today is the birthday of Lionel Barrymore (1878-1954). One of my most prized possessions is an autographed copy of his 1953 novel Mr. Cantonwine, which happens to be about a medicine show! We wrote a little about Barrymore and his siblings and their connection to vaudeville here. Of the three Barrymores of their generation I think Lionel has the strongest claim to the hamular crown. While John was second to none in the scenery chewing department, he was also capable of great naturalness. Lionel on the other hand was always only about straight-ahead theatrical artificiality, and I make that observation without an ounce of implied disparagement. I have learned a lot by watching his screen performances: his bag of tricks is always on full view, transparent, for all to see, hear and enjoy. He is like an acting machine. It is for this reason that he is in scores of Hollywood and radio classics (and adaptations of literary classics) from the early days (1911 for film, 20 years later for radio) through the early 1950s. He was perfect for Dickens, Robert Louis Stevenson, and for horror. Some of his more memorable talking pictures include Mata Hari (1931), Grand Hotel (1932, with John), Rasputin and the Empress (1932, the only movie featuring all 3 Barrymore siblings), Dinner at Eight (1933, also with John), Treasure Island (1934), David Copperfield (1938), The Little Colonel (1935) with Shirley Temple, Camille (1936), Captains Courageous (1937), and Kaufman and Hart’s You Can’t Take It with You (1938). In 1938 he broke his hip. The injury never properly healed, but Barrymore didn’t let that stop him. He continued acting for another 15 years, playing his roles from wheelchairs (or seated). For years he played Dr. Gillespie in the Doctor Kildare films. Then came other classics like Frank Capra’s It’s a Wonderful Life (1946), Duel in the Sun (1946), and Key Largo (1948). Nearly everything Barrymore did had the aura of specialness. There are upwards of a hundred additional credits besides these; can’t list ’em all, just check out his IMDB entry here. (And for the deets on his stage career, see here).